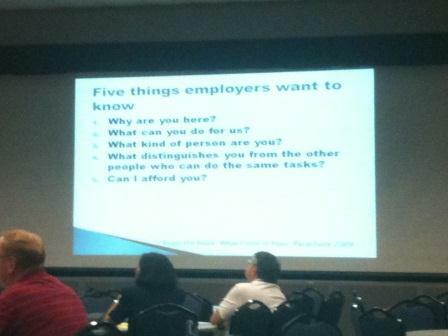 Last week I was invited to speak about financial literacy to NASA employees down in Houston that are being laid off. One of the other speakers was a recruitment and job placement specialist. He had this slide which I thought was good for employees looking for a job, but also for those of us already employed or self-employed. Do you have a good answer for each one? •What can you do for us? •What kind of person are you? •What distinguishes you from the other people who can do the same tasks?